Each year the Legends Golf Course honours an Albertan that has made significant contributions to golf in Alberta. The first inductee into the Legends of Alberta Golf in 1995 was Alex Olynyk. Alex was a builder and founder of Edmonton’s Windermere G&CC and served as the facility’s first Head Professional. Alex mentored several apprentices into Head Professionals, including Sandy Robertson, Bill Wright Jr., Monte Koenig and 1954 Canadian Open Champion Pat Fletcher. 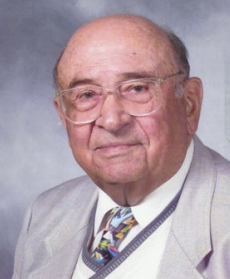 He opened the city of Edmonton’s first driving ranges and was a teaching professional for more then 60 years. His many students included much celebrated ladies’ champion Betty Stanhope Cole and Canadian Junior champion, Rob McMillan. In 1998 Alex was honored at the Legends Golf Course, where his favorite saying can be found on a plaque, “The person who wins at the game of golf isn’t the one with the lowest score, it’s the person who enjoys the game the most.” Alex Olynyk became a Life Member of the Canadian PGA in 1988. More information on Alex and his bio can be found at the Alberta PGA website.